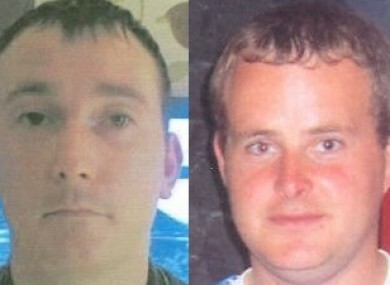 THE GARDAÍ WILL resume their search this morning for the two men from Coolock who have not been seen since Tuesday. The gardaí confirmed that the search for Eoin O’Connor and Anthony Keegan will resume shortly at the Westmeath lake where the car the men were travelling in was discovered yesterday. It is believed that garda divers were at the scene searching the lake last night, with gardaí stating this morning that all resources necessary will be used today in their search for the two men. The car in which the two men were believed to be travelling in was discovered yesterday at Lough Owel near Mullingar. The silver Ford Focus car in which they were driving was located at a viewing car park beside the lake. The car, which has a registration number of 04-D-46380, has since been removed from the scene. Gardaí are now keen to trace the movements of the car and have asked for the public’s help in so doing. Eoin O’Connor is described as being 6’ tall with stocky build and short brown hair. When last seen he was wearing grey tracksuit bottoms and a blue windbreaker-type jacket with a hood. Anthony Keegan is described as being 5’ 10’’ tall, of medium build with short brown hair and brown eyes. Reports suggest that the men’s disappearance may be connected to a major crime gang and the recovery of a drugs debt. Email “Search to resume this morning for missing Coolock men”. Feedback on “Search to resume this morning for missing Coolock men”.